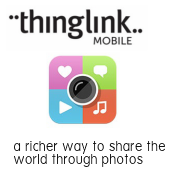 Now you can create and share multimedia rich interactive images on the go with the free ThingLink Mobile App for iPad and iPhone. Just take a photo, tag the image with video or text, and instantly share it through email, Twitter or FaceBook. The new ThingLink App provides mobile users with the ability to quickly embed video and text into any photo for a quick snippet of life as it is happening.